Fall is coming quickly but it's still in the high 90's in DC… Since Labor Day is approaching I know there will be some major sales happening (Don't worry! I'll be sure to round all of them up) so I know I have to begin thinking about a cooler wardrobe even though I'm not ready quite yet. My strategy right now is to begin purchasing pieces that can be layered - nothing too heavy or warm. To help y'all out I thought I would share my Fall picks and the trends that I see coming up! 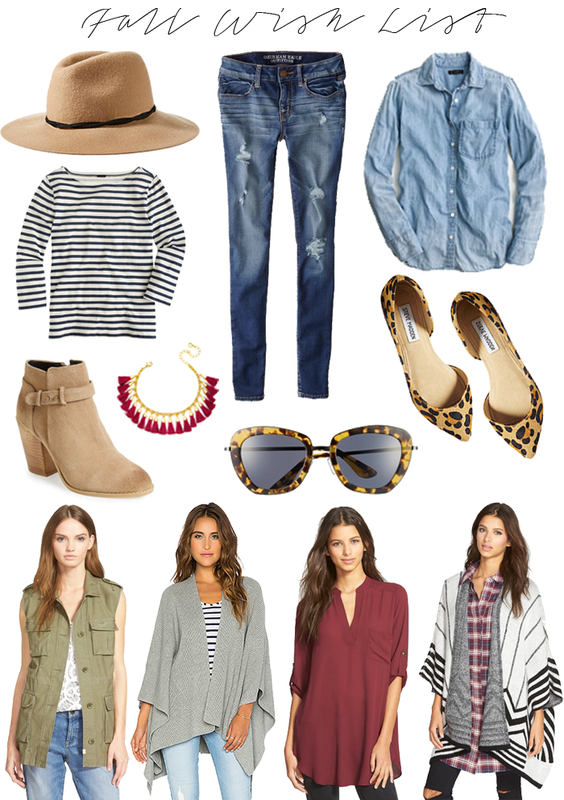 You could mix and match all of these items to create lots of fun layered Fall outfits! Denim // This is obviously a staple every fall so I'm really excited that the distressed look is here. I'm becoming a bit of a jeans gal… hard to believe that since I only had two pairs when I started college (no joke). A chambray shirt can be layered really easily or thrown over a loose t-shirt to cover your arms. Right now I wear it over a maxi dress and knot it at the front! I think I have 3 because they look great with everything - think under a chunky cable knit come winter. Rich Color // Olive and wine are huge this season and I couldn't be happier! I love them in accessories, shirts, shoes, pants, you name it! They'll look great paired with white jeans right now or against an all black ensemble when the temps drop more. Stripes and Leopard // Always a favorite combo and they bring any fall color to life. If you don't have a striped shirt or leopard flats I suggest grabbing a pair now! Striped shirts are one of the best things to transition from summer all the way through winter. It makes you look polished right off the bat and it goes with everything. Booties and Big Hats // Perhaps it's the #basic blogger in me but any shoe that keeps my toes warm when I go out while also giving me some height is a life saver. Another blogger move? Big hats. This chick loves accessories and it doesn't stop with jewelry - I love wearing hats to protect my face from harsh winds and hide second day hair! Big Sunglasses // Holy summer of the sunnies!! From the mirrored Ray-Bans to the infamous Prada lenses… sunglasses are always a great way to hide tired eyes and that hangover you're nursing on Sunday mornings. There's no reason to store them away for fall. DUH! What trend are you looking forward to? I'm ready for leather pants but I'm saving that for my winter wish list… pace yourselves people!! I personally will be keeping my puffer vests and riding boots in storage until the temperature gets in the 70s! I LOVE each of the pieces you chose! I just looked at those booties at Nordstrom yesterday and totally have them on my fall wishlist, too. Those Lush tops are to die for! I have two from last year that I wore all the time and I can't wait rotate the other colors into the mix that I bought this year.